In this post, you’ll learn about the amazing Instagram Feed Pro plugin for WordPress and how you can use it to help increase social engagement for your business, as well as add value to your blog or personal brand website. 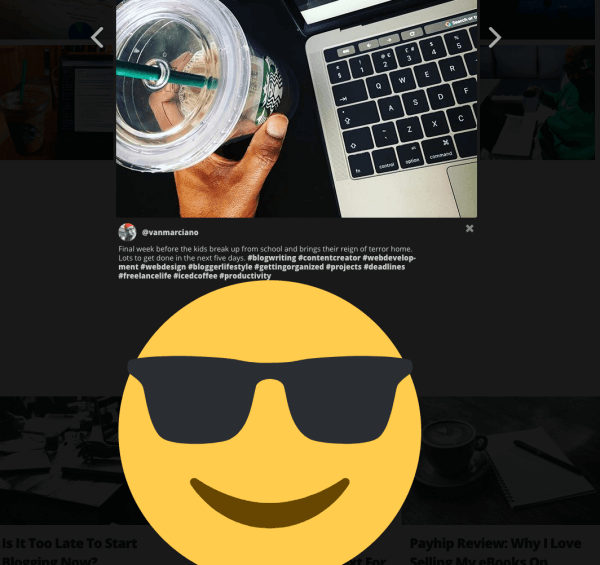 OK, so a few weeks ago, I installed a really cool ‘free’ WordPress plugin on Magnet4Blogging called Instagram Feed by Smash Ballon. If you haven’t then I think you’re going to love it. Since installing this plugin, I’ve completely fallen in love with it, so, I decided to invest in the pro version of Instagram Feed. 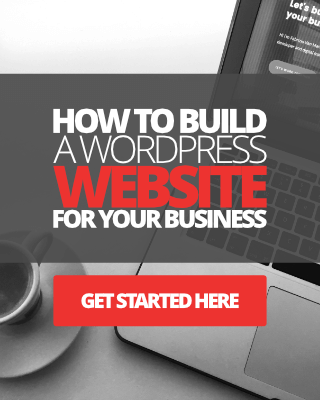 Now, if you’ve been following my blog and online journey for any length of time you’ll probably know that I tend to use mainly premium plugins on my websites. One of the reasons for this is because of the updates and support you get with premium products and online services. I always advise and recommend, whenever possible, to invest in premium tools for your business. Anyway, I’ve had a few emails from you guys asking what am I using to display my Instagram feed on my website’s homepage? Well, hopefully, now you know. 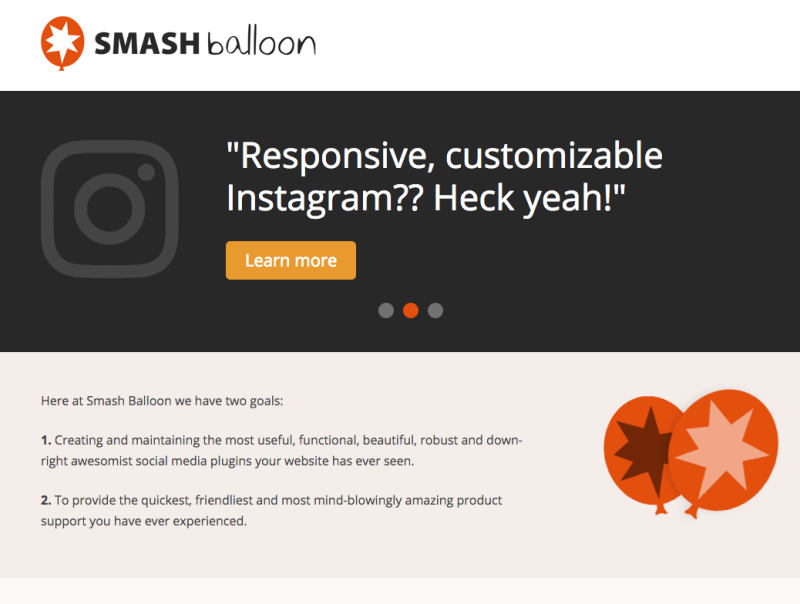 I’m using an amazing plugin called Instagram Feed by Smash Balloon, the pro version, but the free version packs a lot of punch too. What is Instagram Feed Pro by Smash Balloon? This is a plugin designed to make it really simple for you to add a customizable and mobile responsive Instagram feed to any blog post or page on your WordPress website. There is a free and paid version of the plugin, and they both come with a ton of options and features, which I’ll review in just a second. 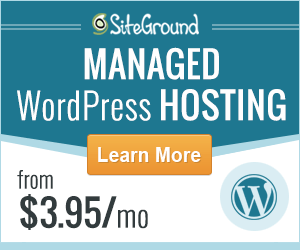 What are the benefits of using this plugin on your website or blog? 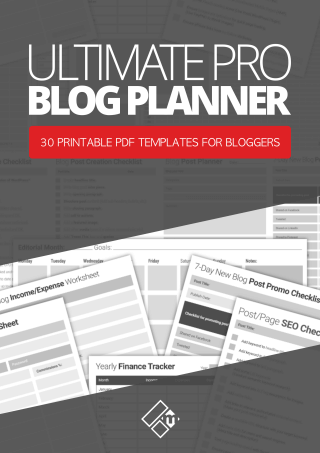 If you’re a blogger, freelancer, or personal brand business owner trying to build a professional profile using social media and, in particular, Instagram, the first big benefit of using this plugin is to help you increase social engagement. So that means increased visibility, growing your followers, getting more Likes and comments to your posts and content on Instagram, etc. The second big benefit is that it ensures your website/blog posts/pages gets fresh content updates regularly. If you take a look at my website’s front page, for example, the images from the custom Instagram feed I created are automatically updated each time I post something fresh on my profile, ensuring that my homepage always has something new and fresh to show off to my visitors. Is it simple to set up and begin using? The plugin itself is simple enough to install and activate, however, to configure it you’ll need to log into your Instagram account to obtain a token and your account user ID. To save you a ton of time, on the configuration page, you can hit the blue login button and this will fetch your Access token and User ID for you. See image below. If you are in the Pro version of the plugin, you’ll get a License key to activate the Pro options for updates and support. What are the main features of this plugin? OK, so let me break this into two parts here. Create a custom feed to show photos from one account. 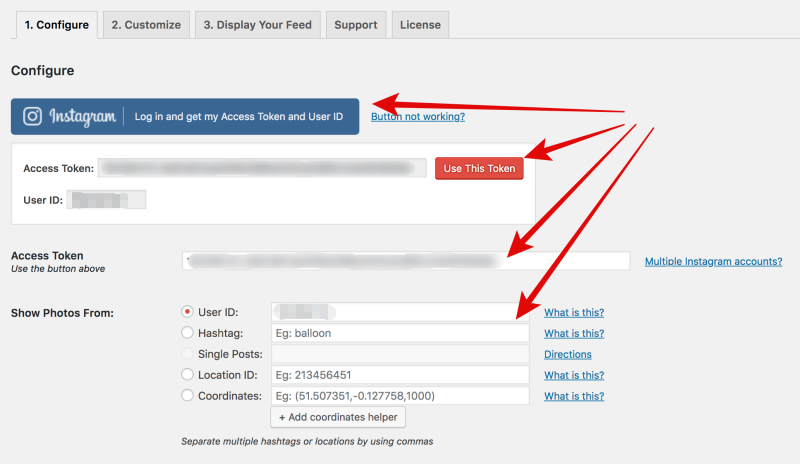 Display your feed with simple shortcodes anywhere on your site. Add a ‘load more images’ feature. Include a ‘follow me’ call-to-action button. Not too shabby, even for a free plugin, right? Now, if you want to have more control over your images and their behavior on your website, then the Pro version allows you to do a lot more. Click here to read the full list of features in Instagram Feed Pro. So, I’ve talked a little bit about some of the features, and most importantly, the benefits of using this plugin on your WordPress website, now let me tell you what I actually love, personally, about Instagram Feed Pro. Customizability – There’s so much you can do to create custom Instagram feeds for any purpose on your website. For example, if you run an e-commerce website you can create a feed just to display the products or services you share on Instagram. You can even create “shoppable feeds” where your posts automatically link to custom URLs. Awesome, right? The shortcode options are plentiful too. I use Thrive Architect page builder plugin for my home landing page, and so using the shortcode inside a HTML Element to display my feed is so simple (Watch the video to see how I’ve done this). 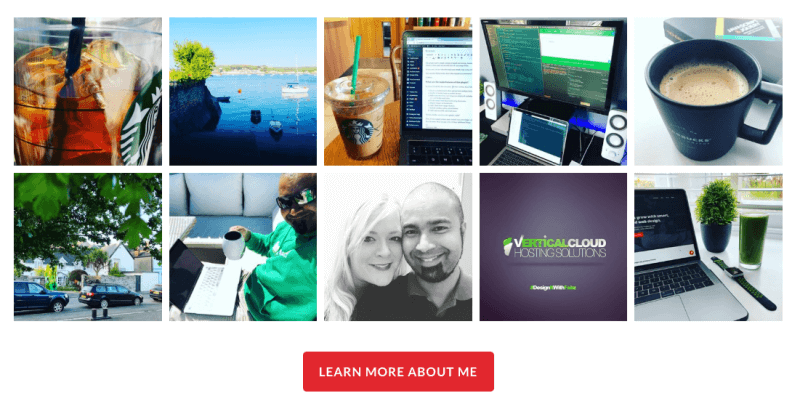 Fresh content updates – I also love the fact that each time I update my Instagram profile with content, my website is automatically updated with fresh new content too. Rather than having to log into my site, upload new images manually every so often just to keep things fresh, this is done for me through my custom feeds. Easy to set up and customize – Personally, I hate wasting valuable time learning how to configure complicated plugins and themes, however, Instagram Feed Pro is so simple to set up and forget about, plus there’s assistance provided in the settings and configuration page. Finally, the support is just fantastic. I had a few questions regarding the use of this plugin on my site and all of my questions were answered promptly via ticket submission. Just a few things niggle me with the plugin. I found that on rare occasions that when I update my Instagram profile it does take a few hours or more for the updates to appear on my custom feeds. I think that’s because of the cache setup I have on my site. Just call me impatient I guess. I’ll have to play around with it I think. Also, if I share an image with a description that contains emojis on Instagram, the emojis themselves can appear quite large when viewing them via the website feed, using the pop-up lightbox. See image below. So this plugin is free, how much is the pro version then? 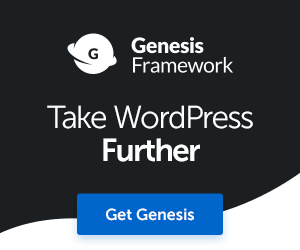 Yes, once again, you can use the free version of this plugin and still get access to a ton of awesome features if you’re looking for something simple. 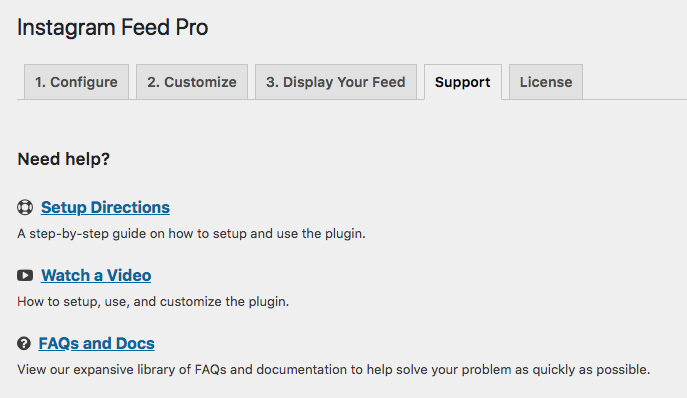 If you’re looking to have more control over your feeds in terms of customization, purpose, functionality, then the Pro version will cost you just $39 for a single license. If you want to use Instagram Feed Pro on up to five websites, then that will set you back $79. For unlimited use then $119 is the price for the Developer License. OK cool, but what benefits are YOU actually gaining from sharing your Instagram feed on your website, Fabrizio? If you look at the front page of my website you’ll see that my customized Instagram feed doesn’t just contain content related to my business, but also content that’s quite personal too. With Instagram, I love to mix up content related to my work and also share moments from my personal life too. From a personal brand building perspective, I think that’s extremely important. You might completely disagree, I don’t know. The thing is, I want people visiting my website to see that there’s a real person running the show here, and not some tie-slinging, marketing trash talking corporate jockey or some automated bot, but someone they can relate to. I want folks to see what really goes on in my business too, behind the scenes of my business, and of course, in my personal life too. Having the right balance is awesome and possible with Instagram, which is one of the reasons I love using this platform for marketing and increasing awareness about my personal brand business, products, and services. For me, having a personal brand business isn’t about hiding yourself behind a logo. Having a personal brand business is about becoming the ultimate brand ambassador for your business. Instagram helps me to promote the business of ME. According to Brandwatch, almost 50% of brands today are on Instagram, and it is predicted that this number will rise to 70%. 50% of Instagram users follow brands. OK, so that wraps it up. Enough waffling from me. You just read my personal review/overview/insight into the Instagram Feed Pro by Smash Balloon, plus I share how I’m using the plugin on my website/business and what benefits I’m gaining from it. My final verdict is that if you’re a blogger, freelancer, personal brand business owner and love using Instagram to grow your social engagement and promote your online business, then this plugin is a must have, in my opinion, anyway. And, if you go for the paid-for Pro option, you can enjoy a ton of additional features, free updates, and reliable premium support. Do I recommend Instagram Feed Pro? Of course, I do, Yes, absolutely. Are you using Instagram to help you promote your brand and reach new customers? Would this be a plugin you’d be interested in trying out?